Lotto – Results for 21/12/18. Numbers drawn were 3, 6, 26, 28. Lucky dip winners were Ray O’ Carolan Mohill, John Louis Reynolds Eslin, Gabrielle Mc Cabe Eslin, Marie Cashin Cloone. Results for 29/12/18. Numbers drawn were 10, 12, 18, 26. Lucky dip winners were Mickey Gannon Gortletteragh, Tom Taylor Castle St. Mohill, Micheal Wall Barber, Micheal Reynolds Bunnymore. New Year – The club would like to wish all their members, supporters, players and everyone in the area a happy and healthy new year. Congrats – Congratulations to Claire and Dermott Mc Loughlin on the birth of their baby boy Padraig, also congratulations to Siobhan and Ciaran Ward on the birth of their baby boy Paudie. Training – Training for the 2019 season starts next Sunday 13th at 11am. All available players are asked to attend as we are also fielding a second team this year. All players old, young and new are welcome. Division 2 league is a step up for us this year, so we need everyone to put in a big effort from the start. Best of luck to the players and management in the year ahead. Dinner Dance – Our dinner dance is taking place in Lough Rynn Castle on Saturday February 2nd. Tickets are now available. Anyone who would like tickets can contact Enda 087 9062787, Claire 087 3707248 or Colm 087 9000573. CFR Ireland – (Community First Responders Ireland). In Ireland 5,000 people die each year from cardiac arrest, 13 people everyday. These people are going about their daily lives, at home, at work, shopping, at sports events and collapse and die without any warning. 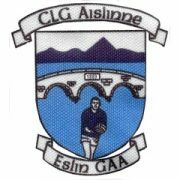 Eslin are setting up a Community First Responders and are looking for the support of the Eslin Community. Their is an information night on January 25th in Eslin Community Centre at 8.30pm. Everyone is welcome. (www.cfr.ie) for more information.